국보 제124호 강릉 한송사지석조보살좌상(2014년 국보 동산 앱사진). 원래 강원도 강릉시 한송사 절터에 있던 보살상으로 1912년 일본으로 옮겨졌다가, 1965년 조인된 ‘한일협정’에 따라 되돌려 받았다. 잘려진 머리 부분을 붙일 때의 흔적과, 이마 부분의 백호(白毫)가 떨어져나가면서 입은 손상이 남아 있을 뿐 거의 완전한 형태를 갖추고 있다. 머리에는 매우 높은 원통형의 보관(寶冠)을 쓰고 있으며, 상투 모양의 머리(육계)가 관 위로 높이 솟아 있다. 볼이 통통한 네모난 얼굴에는 눈이 가느다랗게 새겨져 있고, 입가에는 엷은 미소가 번져 있다. 목에는 굵은 3줄의 삼도(三道)가 그어져 있으며, 3줄의 목걸이가 가슴까지 내려와 있다. 양 어깨에 걸쳐 입은 옷에는 부드럽고 자연스러운 옷주름이 새겨져 있다. 검지 손가락을 편 오른손은 연꽃가지를 잡고 가슴까지 들어 올렸으며, 왼손 역시 검지 손가락을 편 채 무릎 위에 올려 놓았다. 발은 오른쪽 다리를 안으로 하고 왼쪽 다리를 밖으로 하고 있어서 같은 곳에서 발견된 강릉 한송사지 석조보살좌상(보물 제81호)과 반대이다. 한국 석불상의 재료가 거의 화강암인데 비하여 이 보살상은 흰 대리석으로 만든 점이 특이하다. 조각 수법과 아울러 재료에서 오는 질감이 좀 더 우아하고 온화한 기품을 느끼게 해준다. 약간 오른쪽으로 향한 듯한 얼굴과 몸은 풍요로우며, 조각수법 또한 원숙하고 정교하다. 원통형의 보관이나 풍만한 얼굴, 입가의 미소 등은 강릉 신복사지 석조보살좌상(보물 제84호)과 평창 월정사 석조보살좌상(보물 제139호)에서도 공통적으로 보이는 특징인데, 이들보다 한층 더 세련된 솜씨를 보여주고 있으며 만든 시기는 고려 초인 10세기로 추정된다. Originally kept at the Hansongsa Temple site, this piece was taken to Japan in 1912 and returned to Korea following the signing of the Korea-Japan Treaty on Basic Relations of 1965. It is in relatively good condition, except for the trace of reattaching the head torn off from the body and the white hair on the forehead, which is gone. The statue wears a very tall, cylinder-shaped crown, with usnisa (a protuberance symbolizing supreme wisdom) placed atop the crown. The square-shaped face wears a tender smile and has half-closed eyes. The neck shows three thick lines. A three-lined necklace hangs down to the chest. The robe is inscribed with wrinkles that look soft and natural. The right hand holds a lotus branch up to the chest. The left hand is placed on the thigh. The forefingers of both hands are fully extended outward. As for the position of the feet, the right foot is placed behind the left one. These foot positions are the opposite of its twin (Treasure No.81) found from the same temple. 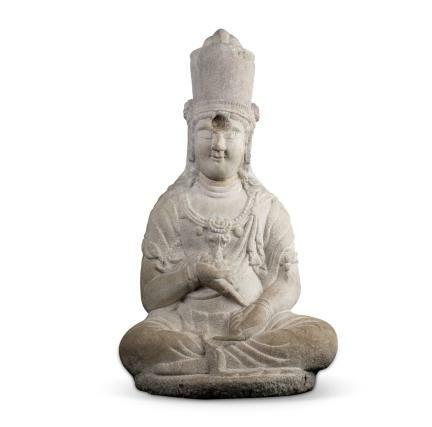 This statue, made of white marble, is distinguished from the other stone statues found in Korea, which are mostly made of granite stone. The texture of the material used, along with the sculpture technique, gives a graceful, warm impression. Overall, the body looks plump and exhibits mature and exquisite sculpture technique. 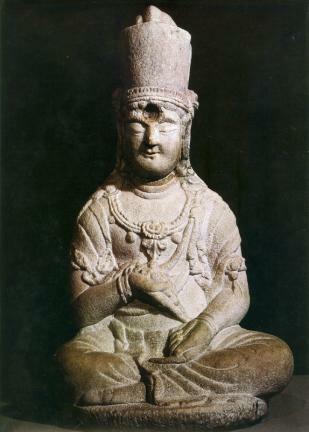 The cylinder-shaped crown, the plump face, and the gentle smile are features shared by those of the Stone Seated Bodhisattva at Sinboksa Temple Site, Gangneung and Stone Seated Bodhisattva of Woljeongsa Temple, Pyeongchang (Treasure Nos. 84 and 139, respectively). Note, however, that this one exhibits a sculpture technique that is one notch higher than that of the former. This one was presumed to date back to the 10th Century during the early Goryeo Period (877-1392).